Greetings from Olympia! The 2019 legislative session got under way Monday, and things are already moving along quickly at the Capitol. This is a budget year, meaning the Legislature is tasked with approving a budget for the 2019-21 biennium. We will also be working on a variety of other topics, including the needs of our mental health system, clean nuclear energy and STEM education. Democrats have larger majorities in both the Senate and House now because of the November elections. We will have to work harder than ever to make sure that the voices of the Tri-Cities are heard and that the Legislature works to address the needs of all of Washington. 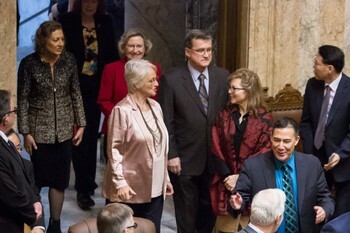 It was an honor to be selected by my colleagues to serve as Senate Republican Caucus Deputy Leader. This year six of the eight positions on the caucus leadership team are occupied by women! If there is anything I can do for you related to the Legislature or working with a state agency, I encourage you to contact me. I am always happy to help. Thank you for the honor of serving as your state senator. If you have questions about anything in this report, or anything else related to the Legislature, please give me a call at (360) 786-7614 or send me an email at Sharon.Brown@leg.wa.gov. I always appreciate hearing from you. 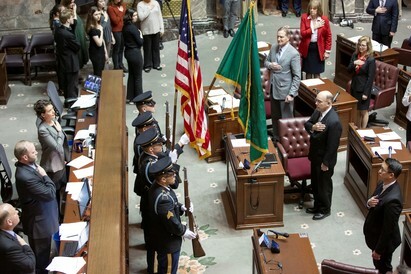 Thank you for the honor of serving you in Olympia. My first legislative video update for 2019 features members from the Benton Franklin Parent Coalition talking about how the Legislature can help those with developmental disabilities live more independently. Senate Democrats used their majority position to redefine and add committees this year. Most Republican senators saw major reshuffling of their committee assignments as a result. I will be serving as the Deputy Republican Leader on the budget-writing Ways and Means Committee and will also be a member of the Energy, Environment and Technology Committee, as well as the Higher Education and Workforce Development Committee. Mental Health – adopting policies to ensure some of our most vulnerable get the treatment they need, providing sufficient funding to meet the state’s mental health-system needs, as well as providing support for senior citizens, our disabled veterans and people with developmental disabilities. Human Trafficking – continuing to fund local programs that provide services to victims and survivors of trafficking and provide training opportunities to law enforcement to further the state’s anti-trafficking efforts. Science, Technology, Engineering and Math (STEM) Education – continuing to support our local STEM education in middle schools by pairing STEM professionals with students in small groups to teach them about the education and experience needed to find jobs in their current field. Streamlining business regulations – adopting policies that make it easier for employers to create and maintain jobs in our state, as well as policies that make Washington more competitive with other states and countries in attracting employers.